i believe in health care that is based on a personal commitment to meet patient needs with compassion and care.I'm dedicated to providing optimal health care in a relaxed environment where I treat every patients as if they were my own family. 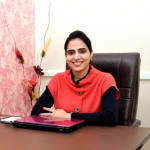 Dr. Parminder Chaman is a popular Dermatologist in Ramghat Road, Aligarh. She has over 23 years of experience as a Dermatologist. She has done PG Diploma In Clinical Cosmetology (PGDCC), MBBS . She is currently associated with Panache Skin,Hair and Laser Clinic in Ramghat Road, Aligarh. Save your time and book an appointment online with Dr. Parminder Chaman on Lybrate.com. Lybrate.com has a number of highly qualified Dermatologists in India. You will find Dermatologists with more than 39 years of experience on Lybrate.com. Find the best Dermatologists online in Chandigarh. View the profile of medical specialists and their reviews from other patients to make an informed decision.